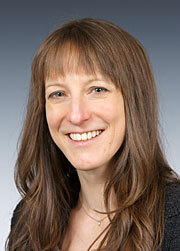 Ann Van de Winckel, PhD, MSc, PT, is an assistant professor in the Program in Physical Therapy. Her goal is to understand the neural mechanisms of neuroplasticity and recovering after stroke. She does this through the use of fMRI, structural and functional connectivity to determine the impact on clinical sensorimotor outcomes. Van de Winckel’s additional goal is to translate these findings to therapeutic interventions aimed at sensorimotor recovery. Van de Winckel has experience with clinical research both in stroke patients and in children with cerebral palsy, specifically on recovery of the arm and hand and even more specifically regarding training proprioception (body awareness) to improve motor performance. Van de Winckel also has extensive experience in both development and statistical evaluations of clinical scales for stroke patients. Van de Winckel's current research interests include shedding light on the impact of stroke on specific brain areas (insula and cerebellum) and its connections in relation to body awareness, motor imagery and how rehabilitation treatments can trigger neuroplasticity in these brain areas and their associated brain connections. Van de Winckel places emphasis on investigating the interactions between attention, motor imagery, body awareness and physical impairments in order to improve rehabilitation strategies to increase recovery. Currently, her research is focusing on proprioception in adults with stroke. Read Dr. Van de Winckel's full bio.